Indian Centre for Plastics in Environment (ICPE), a representative body of the plastic industry, initiated a pilot project on segregation of domestic waste, collection and separation of solid waste that is later to be disposed off safely by the BMC. An NGOs organization, NAGAR and BMC helped ICPE put this system in place in Cuffe Parade in April 2001. It is still working very efficiently because citizens of Ward-A here living in over 160 buildings have realized the worth of their contribution in keeping their environment clean, bereft of solid waste, including used plastics being strewn around. ICPE has extended the successful Cuffe Parade experiment to 5 other municipal wards such as Malabar Hill, Dadar Parsee colony, Bhandup, Mulund and Andheri / Vile Parle East. ICPE sponsored the project in association with NAGAR and BMC in the early last year to link citizens, government and the plastic industry. With the cooperation of NAGAR through its Project Co-ordinator Ms. Priya Ubale and BMC through its Ward officer for Ward A, Mr. Kiran Achreker, the programme of segregation of dry and wet garbage in the Cuffe Parade residential area was put into operation in April 2001. The individual residents keep two separate bins to segregate dry and wet garbage. The dry and wet garbage bins are emptied into specially designated collection rooms on the ground floor of the building. Seven rag pickers arranged by Stri Mukti Sangathana are assigned the task of loading the BMC van from each of the buildings on a daily basis. They have been provided with safety wear such as Apron, Rainy shoes, Rain coat ,cap by ICPE. 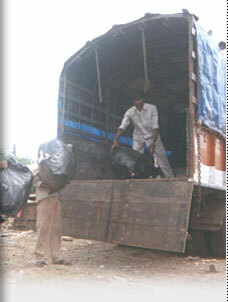 After collecting dry garbage from the participating buildings the BMC van dumps the waste in a corner of Suraksha garden  designated by BMC. The rag pickers sort the waste material into plastic, paper, glass, metal and keep it ready for the Recyclers. The ICPE Recyclers / dealers take stock of the sorted material and make payment to the rag pickers as per the prevailing market rates. So far, ICPE has funded the project to the tune of Rs.1,00,000. Ultimately, ICPE expects to make this entire operation - starting from segregation at the household level up to the lifting of sorted dry garbage by the recycler - to be self-sustaining. Expansion of the project to 5 more Municipal wards in different parts of the city in the coming months is likely to cost ICPE, Rs. 3.5 lakhs a year. The combined effort of ICPE, BMC, NGOs group NAGAR and Stri Mukti Sanghatana has proved that private initiative and governmental cooperation is the only sustainable solution to this major problem of solid waste management in a city like Mumbai that produces 7,000 tones of garbage every day.